London Sash Window Repairs Ltd’ list and description of most up-to-date, accurate, and competitive sash window prices available online, anywhere (as of March 2019). We have updated our pricing to also now carry out one window repairs and we have updated new double glazed sash windows pricing to reflect client requests. Please note our sash window prices will not change unless this page is updated by date. Please also note that these prices form a guideline and are correct for most home owners. If you have difficult access or for example you live on a Red Route, then achieving these low sash window prices isn’t always possible but we are always as transparent as possible in our site inspection and will provide costings during site assessment if you require. Small/Medium sash windows (under 2m in height and under 1.4m in width): £248.00 – £288.00 per window. This cost includes full service, replacement sash cords, new sash window furniture, and timber moulds with a pre-installed draught proofing carrier and pile. Large Sash Windows(anything above the small/medium range): £268.00 – £348.00 per window. The only difference between this and the small/medium bracket in terms of service is the price. The standard draught proofing price starts from £248.00 and although windows are a different size there are a whole host of variables that will affect the price for example require counterbalance (added weight), minor repairs, or have limited access. Most typically the cost of sash window draught proofing is in the lower end of our pricing bracket. Approximately 4 out of 5 installations are in the lower to mid range of both sash window draught proofing price ranges quoted. Venetian Sash Window: £388.00 – £488.00 per window. This is a window with two fixed side panels – three windows in a straight line next to each other, and typically the two side fixed panels are smaller than the middle operational sash. The sash cords run into the sides of the frame, through a machined groove in the head of the frame. This type of sash window is a little more complex than your average sash window and takes more time to draught proof and overhaul. Please carefully note that with all overhaul and draught proofing services painting and touch up is expected after. We rebated and install draught proofing grooves to sashes and frame, this naturally needs touching in. To give you a reasonable idea, if the windows were in perfect decorative order prior to install, then minor touch up of trims, sash, and frame are required. If the sash required painting before, it will definitely need painting after. 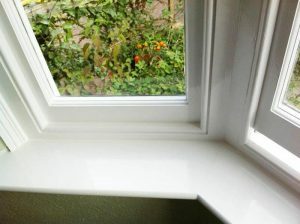 Sash window sill replacement: £120.00 – £240.00. Pricing varies on softwood, hardwood, and the extent of the repair required. There is the amount of labour to correctly house sill and styles to consider as well as leaving the repair primed, undercoated, and ready to decorate. Sill splice: £80.00 – £160.00. This is a less extensive repair than entire replacement. We will splice when replacement is no longer cost effective or we feel a splice will not provide the lifespan one should expect from having windows fully repaired and renovated. Replacement Sash: £170.00 – £300.00. Lower sashes with little or no glazing bar, made in softwood, primed and undercoated that are not excessively large (under 1.2m2) will attract the lower end of the pricing bracket. Upper sashes are exactly the same. In the event a sash requires replacing and the client does not require draught proofing the cost will also include a charge of £120.00 to record and install the new sash. As is clear from our sash window prices, paying for an overhaul and draught proof should new sash be required, represents far better value for money. Almost all customers opt for this service whilst having any essential repairs carried out. Overhaul: £120.00 – £160.00. Overhauling consists of replacement sash cords, counterbalancing as required and generally ensuring sash windows travel smoothly. Perished putty will be replaced as well as pulleys lubricated for improved function and removing any squeaks from the original pulleys. A draught proofing system is far superior to this service and much better value for money. Please note this price is based on a run of windows and for a medium sized sash window. Larger windows attract higher pricing. Overhaul & Draught Proof and Decoration: £520.00 – £720.00. We are now offering a complete overhaul, draught proofing, and decoration package as standard. This service includes new sash window furniture and security restrictors. Windows will be removed, overhauled, prepared, bare timber primed, undercoated, and receive a one coat of gloss. We use Dulux Weathershield for a lasting finish. Please note repairs will be additional to these prices. Please note that all prices exclude a full gloss coat finish for new joinery and for double glazing of existing sash windows, decoration will be required on completion at some point in the near future – with new joinery we can offer a factory spray finish, please allow approximately ten percent of the overall price for this. We are also happy to quote for decoration on request for new sashes in the original frame and the prices are only separated because of such a large number of homeowners that like to make this saving for themselves. 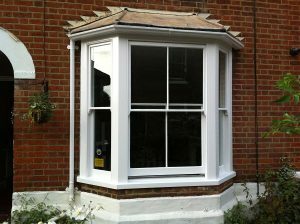 All prices quoted are based on quality, standard Argon filled, energy efficient double glazed units and softwood timber. We are very happy to quote for hardwood as well. Please allow an additional twenty percent on these prices for hardwood replacement sashes, and a full replacement around thirty five percent should be allowed. Double glazing existing sash windows: £480.00 – £780.00. 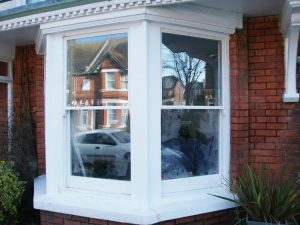 This service involves removing single glazing, rebating sash and installing a double glazed unit within the original sash. Counterbalancing and draught proofing then takes place and is an additional cost. Please refer to the draught proofing section above for combined costings. We supply Brighton fastener and sash lifts, security restrictors are an additional cost. Please refer to our sash window prices for hardware. Smaller sash windows that require little or no glazing bar will attract the lower end of the pricing bracket. Manufacture and fit double glazed sashes in original frame: £620.00 – £980.00. Sashes are installed into original frame to match like for like. In some instances double glazing existing sash is not possible, or originals are removed and therefore we need to manufacture new sashes to fit original frames. This service does not come inclusive of a draught proofing system and this cost needs to be combined. Full window replacement: £1280.00 – £1980.00. 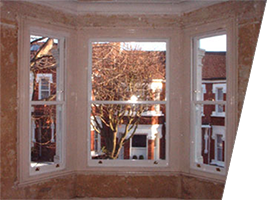 Sash windows can be supplied glazed, unglazed, primed, undercoated, and glossed. Windows can be supplied at any stage of finishing should you require a bespoke finish or solution. Replacement furniture: £22.00 per set. Brighton fastener and sash lifts supplied and fitted in Brass, Chrome, or Satin Finishes. Please note from our sash window prices that hardware is included in an overhaul and draught proof. Security restrictors: £22.00 per set. Two bolts are install 100mm above the lower rail to allow ventilation and block full travel. Inserts are also installed to block any travel at all to improve security and validate insurance. This is an additional cost to our services and is a stand alone sash window price. Decorate sash internal: £120-£360. This price includes removal of loose and flaking debris, rubbing down your frame and boxes, facing up any extreme blemishes, making good to putty, prime bare or exposed timber, one undercoat, and a gloss. We only use quality Dulux products for decoration as using lower quality paint is a false economy. Decorate sash external: £120-£360. Whilst overhauling and draught proofing your sash windows we will decorate. This means that we do not need to use costly scaffold. When the price of scaffold is considered, it makes overhaul and draught proofing costs almost zero. If your property is a way up, this is an incredibly useful service that provides unrivalled value for money. French door repairs: £120 – £780. Price varies from small resin repairs to entire lower rail and door rebuilds. We can extensively replace whole sections before the need of costly replacement. Splice can be hard or softwood and finish of repair will be primed/undercoated. Draught proofing: £288.00 – £388.00. Doors are removed, planed to fit and function smoothly. A draught seal is then rebated and installed into all perimeters. French doors are fitted and checked for ease of use and quality draught proofing seal. Casement sash repair: £120.00 – £360.00. Replacement sill, casement sash, and mullion are typical repairs and reflect the wide range of prices. Casement draught proofing: £120.00 – £260.00. Casement removed, minor defects made good, draught seal machined to perimeter and fitted with new hardware to improve security. We provide replacement hinges as required. The last two lines are not strictly sash window prices however London properties have these and it provides a complete service. If you believe we have missed anything or would like further information on our pricing or workmanship then please do contact us for a full onsite estimate. Sash window cord replacement lower sash (standard sash size and convenient parking):£120.00 – £160.00. When a sash cord is broken on the lower sash we will remove the lower sash, open up the framework, and then fit two new sash cords and rebuild leaving the lower sash fully functional. Sash window cord replacement upper sash (large size and convenient parking):£240.00 – £320.00. The process is the same as the standard sash window and large is classified by being over 1.4m in width and 2.2m in height (give or take 3 metre square of opening). Sash window cord replacement lower sash (standard sash size and no parking):£240.00 – £480.00. When there is no convenient parking, unfortunately this significantly increases the installation time and therefore prices are reflective of the additional time taken on site. Sash window cord replacement upper sash (standard sash size and no parking):£340.00 – £580.00. Emergency callout charge including the first two hours labour: £640.00 + VAT. If you have broken glass or a sash window stuck open, or any emergency repair we will normally be able to arrive onsite within a couple of hours and secure your premises. Occasionally windows are well beyond the typical sizes and will fall out of the ranges provided or could be more complicated than average windows. The prices are intended for clear guidance and it’s expected that 99% of jobs will fall into this range. Curved Sash Window Draught proofing: £288.00 – £388.00. We offer the same draught proofing service as standard sash windows but please note, we offer no liability for broken glass and will be an additional cost.